Selecting a color scheme when decorating a room can be a challenging decision, but at least you have the assurance that your choices aren't going to have very far-reaching consequences. What if you were choosing a palette for an entire town? We had the pleasure today of visiting two lovely towns-- in fact, they are both on the official list of France's most beautiful villages. Though they haven't been given any HGTV makeover (thank goodness! ), each has a unique color scheme and very distinctive appearance. Roussillon (roo-see-yoh) is noted for the rich ocher deposits in the clay surrounding the village. Ranging in color from yellow through orange to red, ochers were among the first pigments used by humans. In the late 1700s, ocher powders from Roussillon were shipped around the world. Ocher mining was the driving force in the Roussillon area economy until the development of synthetic dyes virtually shut down the industry. But the rich colors mined from the native soil are still evident in the village. As you wander up the spiraling streets of this hill town, you can find the entire range of 17 colors once mined in the local quarry. This technicolor appearance keeps the memory of the former industry alive, as does the opportunity to wander on the trails of the old quarry and admire the mineral rich clay in its native environment. Though the ochre is no longer pulled from the earth for selling, it is still the lifeblood of the town as its beauty draws tourists and artists who flock to the village to be inspired by the warmth of its gorgeous hues contrasted against the evergreens and azure sky. When you see this perched village, even from from a distance, there's no mistaking it. Roussillon's palette gives it away. We left the town expecting that no other village could be as picturesque as this. We were wrong. Driving up a winding road near the southern edge of the Plateau de Vaucluse, we suddenly noticed that the road was lined with stone walls. "What's up with that?" we asked each other. 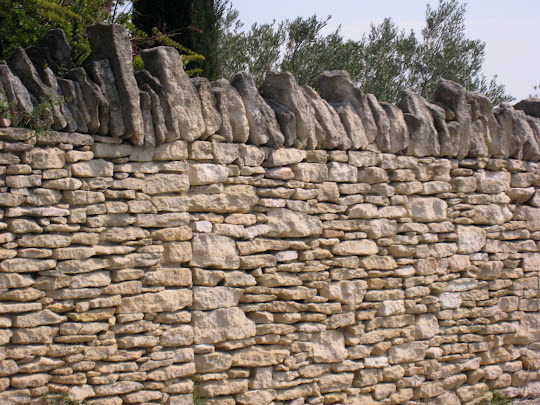 The walls shared a very specific design, flat stones dry stacked horizontally and capped by vertical coping stones. It was obvious that the homogeneity of the design was no coincidence. 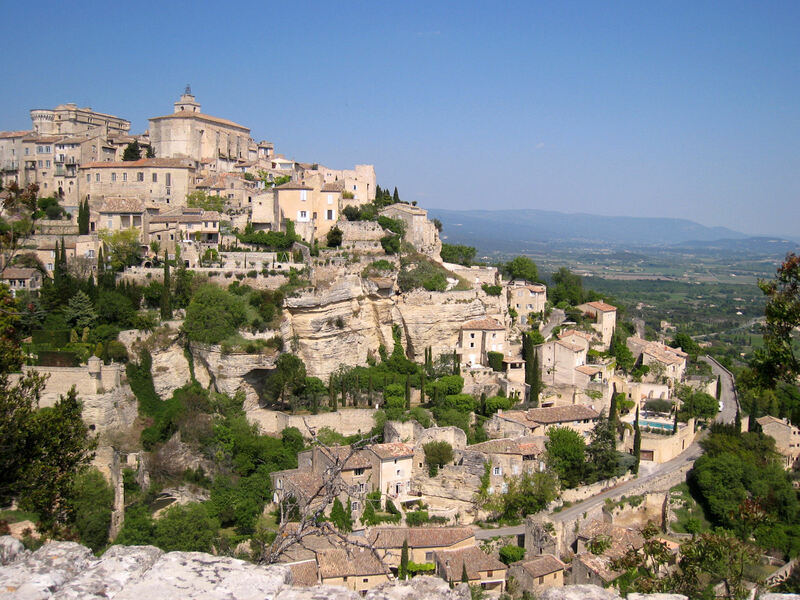 As we entered a hairpin turn and pulled over at the bélvèdere (panoramic view) sign, we discovered the stony beauty of the town of Gordes, spiraling up the limestone bluff. Just as the stacked limestone walls along the approach road foretold, Gourdes (gohrd) is a city of stone. In fact, the village has very strict building codes which prevent the construction of any other type of structure. For both new construction and renovations, Gordes' urban design regulations require a cladding of horizontally laid flat stones, thus ensuring the warm beige harmonious appearance of the town. Fences are not permitted, only stone walls, and modern utilities must be buried underground to maintain the historic feel. The effect is quite stunning and has inspired artists from Marc Chagall to Victor Vasarely and Pol Mara. Cobblestone streets thread their way between tall stone houses to the medieval castle and church at the top of the village. As with so many nearby towns, the area has been inhabited since the (especially appropriate here) Stone Age. 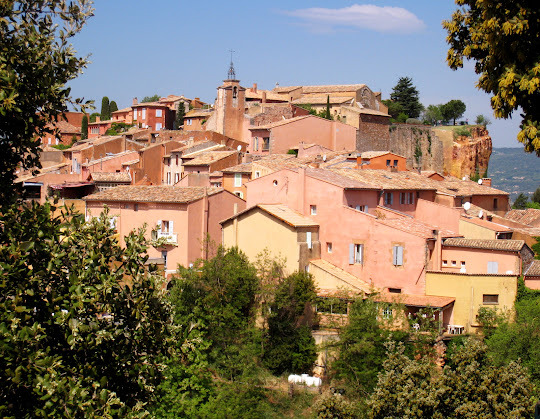 Unlike the nearby hapless village of Menerbes, which is repaving all its streets with what looks like bathroom tiles, it is very easy to understand why both Roussillon and Gordes have been recognized as two of the most beautiful villages in France.